"Something so special as this European project would need to have a future. 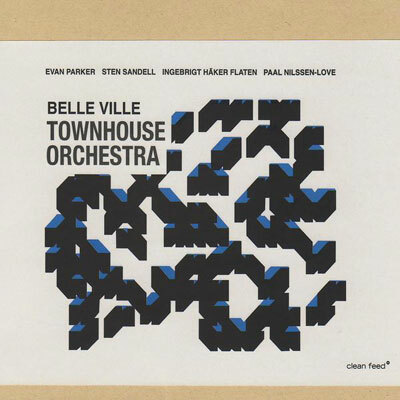 After a first recording with the joined forces of British legendary saxophonist Evan Parker and the very special Scandinavian rhythm section of Sten Sandell (piano), Ingebrigt Haker Flaten (bass) and Paal Nilssen-Love (drums), here is the double CD that confirms the superband status of the Townhouse Orchestra. Not an orchestra, in spite of the name, but a quartet, truth is it sometimes sound as such. The extensive techniques used by the performers multiply the possibilities of each instrument, opening up the perspectives of the music played. Totally improvised, “Belle Ville” is a wonder of energy, commitment and interplay, with two long tracks (one in each disc) of constant surprises. If the individual contributions are astonishing, proving the versatility of the musicians involved, even more magnificent are the collective combinations. No-one tries to overshadow the others, the only rule being the cooperative focus of every moment. Music can’t be more democratic and free than this…"
Recorded live at Belleville, Oslo Norway on the 18th of February 2007.